UPDATE II - Sessions has recused himself from investigations relating to the Trump campaign, which is an appropriate step. His statement is HERE. UPDATE - Sessions will hold a press conference at the top of the hour, so we'll see his response to this controversy. FRANKEN: CNN just published a story alleging that the intelligence community provided documents to the president-elect last week, that included information that “Russian operatives claim to have compromising personal and financial information about Mr. Trump.” These documents also allegedly say “there was a continuing exchange of information during the campaign between Trump surrogates and intermediaries for the Russian government.” Again, I’m telling you this as it’s coming out, so, you know. But if it’s true, it’s obviously extremely serious, and if there is any evidence that anyone affiliated with the Trump campaign communicated with the Russian government in the course of this campaign, what will you do? The wind-up to Franken's eventual question dealt with a CNN report about an alleged "continuing exchange" of information between elements of the Trump campaign and the Russian government. (It should briefly be noted that the even the New York Times and subsequent CNN reporting quoted unnamed officials -- their leakers -- who emphasized that there is no evidence of improper collusion). Franken was directly and specifically addressing a controversy within the framing of the presidential campaign. Sessions responded that he "did not have communications with the Russians." 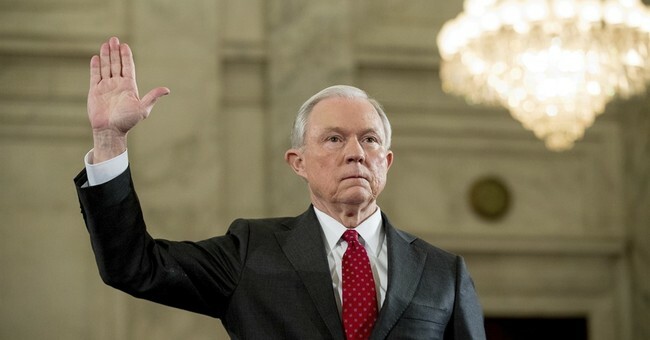 That's not true, broadly speaking: Sessions met with the Russian ambassador twice during the campaign, which his office now admits: One discussion was in Sessions' office -- which was not unusual due to his capacity as a member of the Senate Arms Services Committee; the other was a spontaneous interaction with other Senators at an event sponsored by the Heritage Foundation. Perjury requires proof of willful intent, a standard that allowed Eric Holder to wriggle off the hook twice after sworn statements about various Obama-era scandals were shown to be inaccurate. One such episode was, to my eyes, a much clearer-cut instance of lying than anything we've seen from Sessions. Absent more proof that the public hasn't seen, it seems to be that there is more than enough ambiguity here for Sessions to avoid charges. To accuse him of deliberately lying under oath is a stretch, so Americans are right to view the partisan resignation chorus through a cynical lens. Nevertheless, Sessions' over-broad response does feed the Trump/Russia controversy in an unhelpful way for the White House. The FBI and Justice Department are investigating Russia's efforts at electoral meddling, and if Sessions even appears to be compromised on his impartiality -- and particularly if he's been even a tangential subject of the probe -- it looks terrible for him to continue overseeing the investigation in any way.